Laurie Here - Contemporary Fiction and MORE - Book Reviews: "Megan's Way" by Melissa Foster Blog Tour! SEE GIVEAWAY TAB FOR MEGAN'S WAY! Thursday, June 30th to ALL DAY Monday, July 4th to11:59pm!! "Megan's Way" by Melissa Foster Blog Tour! SEE GIVEAWAY TAB FOR MEGAN'S WAY! Thursday, June 30th to ALL DAY Monday, July 4th to11:59pm!! You Tube Book Trailers! Please copy and paste these into your Browser! first Video Bar. Run your cursor over The Video Bar, and it will change. It is the YouTube Book Trailer for BOTH books! Look to the left side-column. There are two Video Bar's! You will see BOOK TRAILERS! The TOP ONE is for MEGAN'S WAY AND CHASING AMANDA! BOTH BY MELISSA FOSTER! GIVEAWAY!!! '1' PRINT COPY OF THIS BOOK UNDER THE **GIVEAWAY** MEGAN'S WAY TAB!! PLUS, an Author Interview and MORE INFO all about this book! Book Blog Tour Sponsored by WOW! Women on Writing! 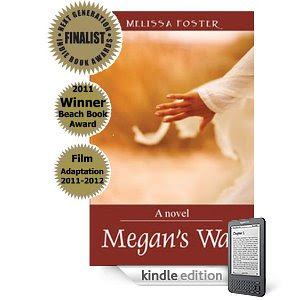 Megan’s Way is a very poignant love story between mother and daughter. Megan has been a single mother to 14 year old, Olivia, and the two of them are and have been inseparable since the day Olivia was born. The love they share is unlike any other. Megan gets hit hard a second time around with a cancer she fought so hard to get survive from the first time. It’s back. Megan knows it is back. Olivia knows it is back without her mother even having to tell her. Megan is trying so hard to hide it from Olivia, but Olivia knows. This time, they both know the outcome is not what they want it to be. It is just known. This time it will be Megan’s way, and no one else’s. Immediately the tone is set where we have the fear of Megan dying and we don’t want her to. We love the strength Megan has. We worry about Olivia. The characters have a very special connection they share together. They know when something is wrong with the other. Call it a sixth sense; call it Spiritual. Olivia is upset, yet very sad at the same time knowing her mother is going to die. Olivia hears her mother in the bathroom throwing up. She sees her in the car pulling over, having to throw up. Olivia knows what is going on. She can feel it. There is no doubt her mother is not going to beat the cancer this time. How does a young 14-year old deal with something like this? The loss of the only parent she has, or ever known and loves? Megan has a very special lifelong friendship bond with three friends who have all been together since childhood. They all care for each other, and especially Megan and Olivia very deeply. They all have their own lives, as well as their own secrets, as all people do. We learn about them all. These characters focus on one thing now. Olivia. As they all go through this loss together, they also suffer independently, as well. Nothing is to be taken for granted. The journey they all go through together as Megan says goodbye is unlike any other friendship I have seen. It is a very Spiritual goodbye. It is caring, and so very, very special. This story is at its finest. There is a lot I have left out of this book review and it may seem a little sketchy, but I did it intentionally. I do not want to give away any spoilers because this book is a must-read book! Do know there is much, much more to this story than what I have written about. There is so much more you won’t want to put this book down, at least I did not want to!. There are some great shockers in it as well, so much so, they will make you literally turn back pages and reread them over to make sure what you just read is correct! At least I had to do that! You will fall out of your chair! Melissa Foster is such a talented and exceptional writer, she has written a book with such a heavy subject matter, something we all fear and dread, yet turns it around to touch our hearts with it. This is writing at its’ finest. This story will stay with you always. You will never forget this book. It puts that mark on our hearts forever. Is it any wonder this book has been adapted into a movie? Yes, it IS that good! This is not just a must-read this book, it is a HAVE TO read book! I give this book a 5-star rating! Remember, I just don’t give out 5-star ratings! The book must be exceptional, and this one IS VERY EXCEPTIONAL! I'm going to post the Author Interview right here because she has some links for you to go to if you would like to check them out! Melissa is a wonderful person (in addition to being a wonderful author! ), she LOVES to stay in contact with her Reader's and takes great effort to do so! At the end of this Interview, all of her links will be posted! You can visit them all if you'd like! You can also LEAVE COMMENTS FOR MELISSA RIGHT HERE AS WELL!!! ***For the GIVEAWAY: PLEASE CLICK ON THE **GIVEAWAY** Megan's Way TAB to fill out the FORM!!! The Giveaway is '1' print copy of her book! GOOD LUCK TO EVERYONE!!! INTRODUCING MELISSA FOSTER! She answers our questions below her photo! Feel FREE to LEAVE A COMMENT BELOW, and, you can ALWAYS contact Melissa at the website she founded, which is called 'The Women's Nest'! The web addy is: http://www.thewomensnest.com Take some time and visit her there! She LOVES company! (To enter the Giveaway, go to the TAB - ***GIVEAWAYS*** - MEGAN'S WAY please DON'T leave a comment to enter the giveaway as there is a specific form under that tab! Enjoy! 1. First, I would like to congratulate you on winning ALL the awards you have won for Megan’s Way! CONGRATULATIONS! I know some of them were finalists. As of now, what are ALL the Awards you have won for Megan’s Way? MELISSA: Thank you, Laurie. So far, Megan's Way was the Winner for the 2011 Beach Book Festival Award in the Spiritual category, Finalist, 2010 Next Generation Indie Book Awards for New Age, and both Megan's Way and Chasing Amanda are currently nominated for the Dan Poynter Global eBook Awards. 2. I see Megan’s Way is going to be a movie! CONGRATULATIONS AGAIN! Can you tell us when it is supposed to come out? Is it a Made for TV, such as Lifetime TV or for the Big Screen? MELISSA: Megan's Way is currently in the process of being cast. The movie will first go to the film festivals, and if it does well, it will hopefully hit the big screen. As for timing, I'm not certain when it will be complete, but we hope by the end of the summer. 3 While the screen writer’s have adapted it into a movie, how much work did you put into the adaption? Did they change it a lot? MELISSA: The director decided to go with my screenplay rather than the one that the screenplay writer and I developed. To that end, I did all of the writing. The director and I are completely on the same page with our vision of the movie. I don't think much of the actual story will be cut out of the movie--if we can keep it within a reasonable viewing period, that is. 4. Did you write an outline of Megan’s Way first? MELISSA: I'm what you might call a "pantser". I don't often write outlines, and I did not write one for Megan's Way. I did do some reconfiguring of the story after the first draft was complete, but not using a formal outline. 5. When writing Megan’s Way, how did you start to write it? Did you start from the beginning? The middle, or the end? MELISSA: When I began writing Megan's Way, I thought the middle was going to be the end. The book was going to be about Megan and the five girlfriends she grew up with--their friendships, secrets, sisterhood. It didn't pan out that way. I quickly realized I had been mistaken, and that this was a story about Megan and her daughter, and their friends. 6. When do you write your novels? I know you are so busy during the day making contact online with your fans, not to mention I read you also have 6 children! MELISSA: I do all of my writing Monday through Friday, from nine a.m. until two p.m., from September until June. I write while my children are in school. The advent and importance of social networking has really changed the amount of time I have to write. I do spend a lot of time reaching out to fans and aspiring authors. I try to help writers any way I can and I love to connect with readers. During the summers, I might spend a few hours marketing or editing, but I don't do any real writing during July and August. That time is spent with my family and as a rejuvenation period for myself. 7. Besides finishing writing a book, what is your favorite part of writing one? Is it the character development, the plot of the story, or something different? MELISSA: Great question, Laurie. Probably my favorite part of writing is meeting the characters and learning about their backgrounds. I think I enjoy that more than completing a book, because I miss my characters once I'm done working with them each day. 8. Have you ever been writing and have your entire story change all on it’s own while writing it? MELISSA: Absolutely. That's what happened with Megan's Way, and with my fourth novel, Shades of Gray, which is my project for the fall. As frustrating as it might sound, it's actually exciting when that happens. Laurie, thank you so much for hosting my blog tour. I'll be checking in all day to respond to readers, and, as always, I'll be chatting with members of the Women's Nest, where all women are welcome. Please Copy and Paste these Web Addresses into your Browers! (The Women's Nest is a website Melissa Foster found for women to connect! There is a LOT more information available there as well, for women! Here is the photo of the book for 'Chasing Amanda' by Melissa Foster! Synopsis: Living in a rural Maryland community, Molly Tanner and her husband are enjoying their newly empty nest. But when a seven-year-old girl disappears from a local park it brings back memories of what brought the Tanners to Maryland a decade ago. Molly unknowingly witnessed another young girl’s abduction in Philadelphia and was almost destroyed by the guilt after the girl was killed. Unwilling to ignore the visions she sometimes has any longer, Molly sets out to find the young girl, jeopardizing the marriage she’d fought so hard to hold together. While unearthing clues and struggling to decipher her visions, Molly discovers another side of Boyds, where the residents--and the land itself--hold potentially lethal secrets. Hi Laurie, thank you for such a wonderful review! I'm thrilled that you enjoyed Megan's Way and I love the detail you provided. I'll check back in a bit to answer any questions your readers may have. Is this an e-reader giveaway? If not, please enter me. I love your blog. Hi! Thanks for stopping by! No, it is a physical book! Hope you enter the contest! If you want an ebook, it is available for 99 cents at Amazon. Enter the giveaway if you'd like to! Thanks again! I should tell you this book won all the awards as an ebook! Really great! If it is an ebook you want, I have a tour with this author on August 4th to the 7th for Chasing Amanda! Mark your calendar! I thought your review was thorough and not sketchy. You gave enough information to let us know whether we wanted to buy the book or not. I also enjoyed your interview with the author. Found you n bookhounds and now following. Thanks! I thank you for your encouraging words about my review of Megan's Way! I was a little worried the reader might want extra details as they pertained to the book, which I left out purposely as the Reader needs to read those for themselves. "I" literally just about fell out of my chair while reading this book! I honestly did have to turn the pages back and reread them to make positive I 'did' read correctly what I had read! I did! This is an amazing story! I hope you filled out the form to have a chance to win the book, and if you don't, I would HIGHLY recommend this book to anyone. The plot is very well written! I am certainly looking forward to reading 'Chasing Amanda' by Melissa Foster, as well! Thank you for appreciating my review! It is always nice to know when you have written a good review! This book IS fantastic! Melissa Foster is a talented author and has a wonderful way with words! Her plot in the story is written in a very well thought out way. There are clues through this story, but I don't think anyone would guess what is to come! This book honestly IS a 'must-read'! I hope you filled out the form for the chance to win the physical hard-copy of this book! It is SO worth reading! It will definitely get you thinking! Even after the book is finished! Thanks to everyone for stopping by today! This contest is open until this Sunday evening at 11:59pm is you know of anyone you would like to send on over to read the review and the Author Interview, plus don't forget to have them enter the contest form! This book IS available in the Kindle format through Amazon for 99 cents in the Kindle Store! The physical copy of the book costs much more. As an ebook, Amazon has made some wonderful books available to us at the 99 cent price! Who says a book for 99 cents is not worth every penny? This one TRULY is! If you don't have a Kindle, there are directions in my left-side column as to how to download the PC APP for the Kindle! You WILL be able to download it for free and read it on your computer! That is what I did before I had my Kindle! It IS a very nice APP to have! It allows you access to ALL Kindle books! Good Luck and enjoy this book if you do win or purchase it! Wonderful interview and review - I have both these books and absolutely love them. Thank you SO much for coming to my Blog and reading my Review and the Author Interview, as well! I am glad you enjoyed them, both! Thank you! Yes, these books are SUPERB!! They are SO good! I am very glad you enjoyed them! I will make sure Melissa gets your compliment! She will be VERY glad you enjoyed her writing! She IS and EXCELLENT writer, isn't she?!!! Thanks again, for coming by my Blog! I hope to see you again! I will make sure to come to your Blog, as well! Elizabeth, good luck in the contest! Sharon, I'm glad you enjoyed Laurie's review. She's very detailed, and has a great blog to follow. Thanks for stopping by! Sarah, keep writing, and thanks so much for stopping by! Denise, I love that you have both of my books. The next one will be out soon. Thanks for your support. I love to see comments on the blogs that host my tour. Thank you all for the support, and feel free to contact me anytime to discuss my books.